The casual dream of many Singaporeans is to start a Singapore food business. Singapore has often been known as the food capital of Asia, and the range of cuisines we have in this little country is immensely vibrant and diverse. Consequently, new restaurants and food business concepts in Singapore pop up like acne during teenage puberty; as do many restaurants shut down in the same time frame. You might be one of these bright-eyed entrepreneurs looking to set up the next Paradise Group Singapore food business and ready to take on the culinary world by storm. You are confident, and buy into the saying that ‘you can never go wrong with food in Singapore’. According to Singstat, in August 2013, total sales value of Singapore food and beverage services is estimated at $603 million SGD, a rise of 2.9% from the previous year. The Singapore food and beverage retail industry is no doubt growing. It is true that there are many success stories of Singapore F&B entrepreneurs like Lyn Lee of Awfully Chocolate or Mr Eldwin Chua of Paradise Group, who have built F&B empires from nothing. There definitely is lucrative profit to be made if you play your cards right. However before you quit your day job, there are very crucial aspects of the food business you need to know about before diving in with your life savings, possibly never to see it again. These 10 things I’m going to share with you will save you thousands of dollars, as well as set you up for tens of thousands more in profit. Read earnestly. For the well-informed Singapore restaurateur, this has been a common hurdle the food and beverage industry has been struggling with for the past few years locally. If you’re new to this trade, take heed that hiring floor, or kitchen staff is by no means easy. Not only are many locals demanding superior pay and simply not willing to work more than 8 hours, the foreign hiring quota is constantly being limited, making hiring quite a nightmare in Singapore. Be prepared to work personally hands-on especially at the beginning for any new food venture, unless you can afford to pay high wages from the start. Many people also regularly skip interview appointments without so much as a text message, a rather discourteous behavior observed during the hiring process. Singaporeans don’t want F&B jobs bad enough. I’m continuously surprised that many food companies operate without the appropriate licenses, or pay external consultants large sums of money for licenses that can be applied themselves at minimal fees. As a start, explore the government site EnterpriseOne to see a list of licenses you will require for operations, from liquor licenses to food shop licenses. Although different licenses come under different statutory boards, EnterpriseOne combines most licenses under one house for easy application, or directs you to the relevant authorities. Note that it is mandatory for all food handlers to attend and pass a Food Hygiene Course which is conducted by external vendors. Upon passing, your certified food handlers have to be registered with National Environment Agency. Due to the limited land of Singapore, rental rates are through the roof. It is common to see similar locations in Singapore going for double the amount as compared to Malaysia. Most major landlords in shopping malls also require a deposit of 3-6 months rent, escalating your base capital needed. Material construction of retail space also involves significant sums of money if you want to build a decent looking outlet, not to mention the costs of kitchen equipment. A small food kiosk can roughly require an upfront budget and operating capital of SGD $80,000 upwards to SGD $600,000 or more for a full restaurant. Don’t enter this industry unless you are cash abundant and can withstand cash burn. Despite the high costs, Singapore’s government also provides many grants and incentives that can be applied to the food and beverage scene. The current most talked about grant is the Productivity and Innovation Credit scheme (PIC) by IRAS, which allows subsidies and cash back rebates for investing in productive or innovative business activities. An automated noodle making machine for example, has higher productivity over hand-made noodles and will qualify under PIC. According to the latest budget review, the PIC scheme is slated to end by 2018. 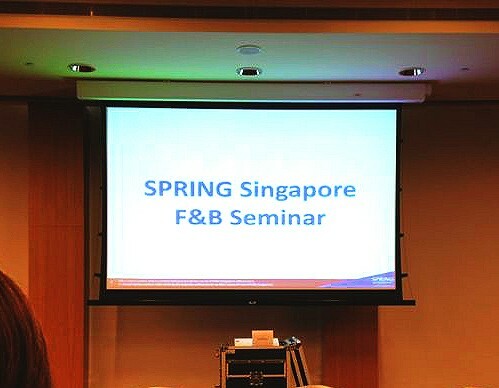 SPRING Singapore also has countless variations of grants like the Capability Development Grant, which can provide subsides up to 70% of cost when applied to the relevant areas. It is best to call and ask SPRING on what your business is eligible for. Another department to look into when considering overseas expansion is International Enterprise (IE) Singapore. 5. What’s your Marketing Strategy? Far too many entrepreneurs rush to create a brand and business without considering their Unique Selling Proposition, and how they are actually going to get customers. Just building a store and hoping people will come, buys you an express ticket to bankruptcy. Proper planning has to be done, as well as tested, before spending obscene amounts of money on the physical store. If you can don’t have the faintest idea how you’re going to get new customers through your door, look for someone who has the specialized marketing skills to. If not, I’d suggest donating your capital to the World Cancer Foundation for better use of your capital. An almost cheesy phrase that everyone has heard of, it’s no coincidence for this repeated saying. Many new food entrepreneurs will compromise on location either due to cheaper rent, or impatience, then come to regret it eventually. This is something I’ve learnt hard as well, and I can advice you never to compromise on location; passer-by human traffic is a lot more valuable than saving on rent. Never give-in on location. NEVER. You might save on rent in the short-run, but have to spend even more effort and money on marketing your poor location. However obvious this question might seem to anyone intending to open a restaurant, many restaurateurs still make the mistake of depending the whole business on a chef without reasonable assurance that he won’t just up and leave. Restaurants can close down overnight if the sole person who knows how to cook quits. Hiring someone who can replicate the previous dishes is also highly challenging without proper mentorship. This is why many successful food entrepreneurs like Willin Low are chef-owners; they never have to worry about the head chef leaving. Preventive measures must be in place for such a situation, including legal agreements, giving equity as ownership incentive and documenting cooking techniques and recipes that enable someone else to recreate the taste. If you hate talking to people, don’t go into F&B. Service is as important to a customer as the food itself. In the old days, you might be able to get away with really delicious food with service standards of a carrot, but consumers are not as forgiving any more. If you are new and your service is bad, rarely is a second chance given. Service does not come naturally to a lot of people, and most often you will need training for it. The simple gestures of a greeting, smiling and thanking customers are often overlooked by people who have never been trained in hospitality. You have to pay attention to how you are communicating to guests. 9. Profit or Passion drive? You probably have to ask yourself, are you profit-driven or passion-driven in opening a food and beverage business? If you answered the former, I’d advice you to abandon this path immediately. Comparing risk and reward to other investment vehicles, a food business is one of the worst investments to make. Paradoxically, it is only those who have prioritized passion for food over profits who have really made enormous profits in this industry. If you’re in it for the money, you’re in it for the wrong reasons. Lastly, do you have the relevant experience and knowledge to starting a food business in Singapore? It’s like trying sell a painting in a gallery when you’ve never picked up a brush before- what makes you think you will be successful? Sheer determination without a formal plan is foolhardy and leads to failure. Typically, those who are truly driven by passion will work in restaurants, bars or cafes to gain the experience required to build a successful food and beverage business. There are ways to compensate for this lack of knowledge, which is to hire a food consultant and leverage on his experience. Paying for advice will save you a lot more money instead of paying for a steep learning curve. A badly planned concept can lose you tens of thousands a month, way more than what it costs to hire a food consultant. A good consultant earns you tens of thousands instead. Starting a F&B business? Click to read more about my F&B consultancy services.